Ginipic has partnered with Picitup to launch SpiderPic. That’s a lot of pics, and it will undoubtedly be not much of a surprise if I tell you the product has something to do with pictures. Stock photography, to be more specifpic specific. SpiderPic is essentially a meta-search tool for stock photos that aggregates relevant shots from a host of third-party providers and lists results in one crisp interface, pricing from all (eight) suppliers included. As pointed out on the Examples page, these price differences can be quite huge even for identical imagery, so if you find yourself regularly buying stock photos, this is a service you might consider bookmarking right now. When you do a search for say, tablet, SpiderPic returns as much information as possible about each photo, and refer potential buyers to the source for actual purchases of photos or to get more detailed information such as promotions, special offers, and specific license restrictions. The only thing that bugs me is that the prices or price range aren’t actually displayed when you get the list of search results, which means you have to click through every time. The technical challenge behind SpiderPic’s comparison feature, was to create a system that you can use only an image, with no text as a reference, and search in real-time between millions of images and return results within split seconds. We decided to partner with Picitup to supply the image recognition technology since they are by far the best out there – they serve top tier players such as eBay and Shopping.com. SpiderPic also offers browser extensions to enable people to search and compare prices quickly from whatever browser they’re using (though the Google Chrome extension is still in the works). 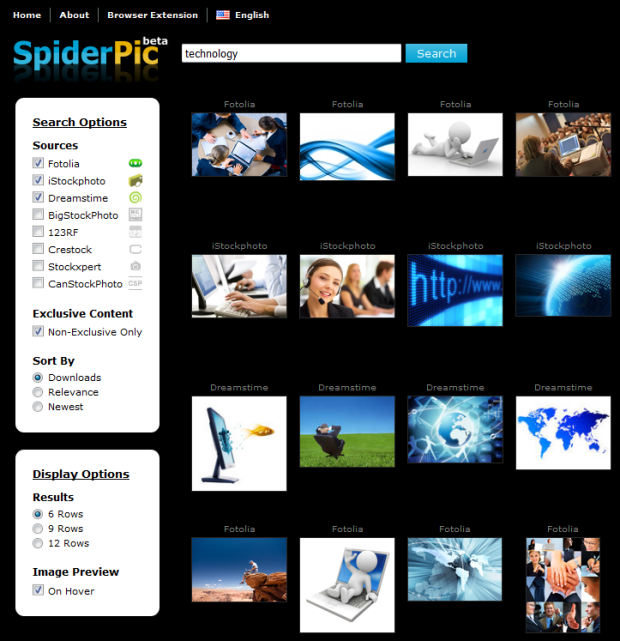 SpiderPic plans on rolling out a similar image search feature soon, which will enable buyers to take any image they found on the web and find out whether the same or a similar image one is available for purchase for commercial purposes on the various agencies they support (Fotolia, iStockPhoto, BigStockPhoto, etc.). With the tool, the startup intends to make it possible for buyers to use any service on the web for searching images, without the need to worry about copyright infringement. Weinstein admitted to me that the agencies are not all happy about the service, understandably. He says he has even received e-mails from some demanding that he remove their search results from SpiderPic. He doesn’t seem all too worried about it, though, and says that the same thing happened when the first regular online retail comparison shopping engines started popping up several years ago. You can read up on Ginipic, which is a desktop application for searching images across photo sharing services, in my earlier review of the product.